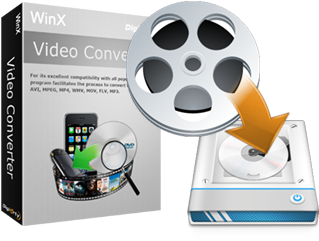 WinX Video Converter supports to convert among ranges of SD/HD video formats, like MP4, AVI, AVC, MOV, WMV, MPEG1/2, 3GP, 3G2, FLV, F4V, ASF, SWF, DV, RM, DivX, Xvid, VOB, MKV, MTS and AVCHD videos. As to playback devices, all iPhone, iPad, iPod, Apple TV, Android, WP8, Xbox, Zune, Surface, Sony PSP/PS4 belong to the profiles. Meanwhile, it provides you outstanding converting quality and fast speed with a stable process. Remember this ease-to-use video converter is totally free and completely clean. Free download right now and for a pleasant try. Download WinX Video Converter to convert videos with high quality and fast speed! Click the Download button below to begin the fantastic Free Video Converting Experience! Easily convert AVI to DVD, MP4 to DVD, MKV to DVD, FLV to DVD, ASF, MOV, RM, RMVB, H.264, OGG, QT, MPEG, VOB to DVD, etc. Moreover, it can download YouTube videos and burn own created videos or website videos. This free DVD ripper is able to backup DVD to hard drive, free rip DVD to MP4, WMV, AVI, FLV, MOV, MPEG, H.264, and convert DVD to iPhone, iPod, Apple TV, Android, Samsung, HTC, PSP, etc. with customized profile settings. WinX Video Converter just fits my appetite. So far I use, I have to admit it is a very easy to use free program without any mistake appeared. Works well with fast converting speed and high quality. Really appreciate it! Fast installation, simple interface and full functions, WinX Video Converter is the best free video converter I have ever used. It converts the video files into almost any other format in an easy and fast way.